Yesterday, Nintendo's executive VP of Sales and Marketing took on all comers in Mario Kart DS over Nintendo's WiFi network at a McDonalds in Bellevue Washington and during the even he apparently made some intriguing comments. He stated that the classic controller expansion for the Nintendo Revolution's controller will look like the Gamecube's Wavebird controller. That's all nice and dandy but the real golden nugget was the fact he noted that Sega was "intrigued" by the Revolution being backward compatible. Intrigued is way too ambiguous for me to think that anything is happening for sure but it does get me a little excited when I think of being able to play old school Sega games on the same machine I'll be playing old school Nintendo games on. 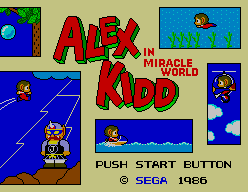 I just hope Sega reaches far back and gives me some Alex the Kidd action.